Love all your guest posters. Like hearing what each brings to the table. I agree with Roberta about toasting the spices in a little bit of ghee or oil. It opens up the flavors so much! This sound like a healthy and comfort meal! This looks super! I also 'fry' my spices first. Thank you, Roberta, for such great information and a delicious recipe! This stew sounds fantastic! It has all of the flavors that I love. I would recommend eating chana dal in moderation because it is hard to digest. I hope it helps. Very informative post. I do like how there are so many ways to use spices. I do enjoy talking about and using spices! Yams and these spices, YUM! I am picking up yams at the market today- always looking for yummy veggie recipes for the week menu! Thanks...and she is right, always toast the spices! A flavourful guest post! Love to learn more about Indian spices! Spices are always good, yum! I have recently started toasting my spices too! 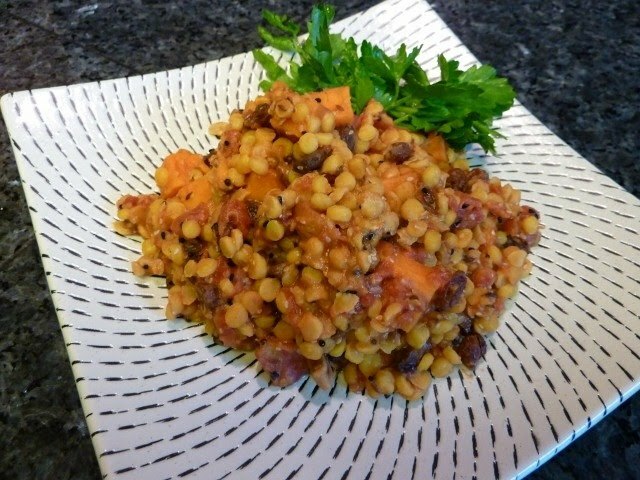 The stew looks wonderful with yams and raisins! It reminds me of Fall. What a beautiful post. I agree, spices are indeed a treasure! This looks delicious! My friend's mum cooks dal almost every time I go over to her place, and I love it! This looks even better, expecially with the addition of raisins!